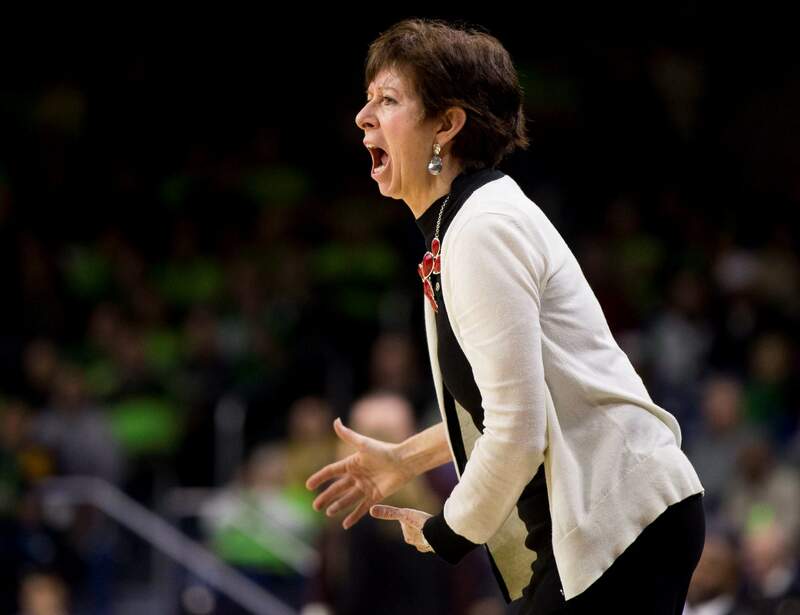 Notre Dame head coach Muffet McGraw yells at her players during the second half of Sunday’s game against Boston College in South Bend, Ind. NEW YORK – Utah coach Lynne Roberts isn’t worried that being ranked for the first time in more than a decade will faze her young team. The 21st-ranked Utes entered The AP women’s basketball poll Monday for the first time since the final poll of the 2008 season. Utah (16-1) is down to just eight players, and four are freshmen. Utah won’t have much time to enjoy its ranking with a difficult part of the Pac-12 schedule coming up. The team hosts California and No. 6 Stanford this weekend before heading to Oregon to face the fifth-ranked Ducks and the ninth-ranked Oregon State Beavers next weekend. “We’re coming into the gauntlet of our schedule. We play three top-10 teams in seven days – welcome to the Pac-12. That’s going to be challenging, we know that. Cal’s really good too,” said Roberts, who is in her fourth year at Utah after coaching at Pacific for nine seasons. The Utes (16-1) were one of four teams to enter the Top 25 after 13 ranked teams lost last week. Utah was joined by Florida State at No. 22, Texas A&M at 24 and Missouri at 25. Utah is off to its best start since 1997, when the team won its first 16 games. The one loss came against No. 16 Arizona State. Utah had a six-point lead with 1:20 to go in that game before falling at the buzzer. The team also lost its starting point guard to an ACL injury. Roberts wasn’t sure how her squad would respond 36 hours later when facing Arizona, and the team responded with a rout. “It was one of my more proud moments,” Roberts said. While there was change at the bottom of the poll, the top eight teams stayed virtually the same, with Notre Dame leading the way. The Fighting Irish received 22 first-place votes from the 30-member national media panel. Baylor broke a tie with UConn for second, garnering seven top ballots. The Huskies got the other one and dropped to third. Louisville and Oregon rounded out the top five. Stanford is sixth, followed by Mississippi State, N.C. State, Oregon State and Marquette. It’s the first time that the Golden Eagles have ever been ranked this high. Tennessee dropped out of the poll after losing its fourth consecutive game last week. Minnesota, DePaul and Indiana also fell out of the Top 25. RISING RUTGERSThe 14th-ranked Scarlet Knights remained unbeaten in the Big Ten with a win over then-No. 17 Michigan State on Sunday. Rutgers moved up six spots this week in the poll and has its best ranking since it was 13th on Jan. 30, 2012. The Scarlet Knights have won 10 consecutive games overall. TENNESSEE WOESThe Lady Vols fell out of the rankings for the third time in the past four years. Tennessee, which is in the midst of its longest losing streak since 1970, saw its run of 31 years being ranked end in 2016. The Lady Vols re-entered the Top 25 at the start of the next season before dropping out in the first week of December that season. They came back in the poll on Feb. 6, 2017, and had been ranked every week since until Monday. BIG EAST PRIDEMarquette reaching 10th is the highest a Big East team has been ranked since the conference split up a few years back. The last time a current member of the Big East was in the Top 10 was the preseason poll of 2011, when Georgetown was 10th.